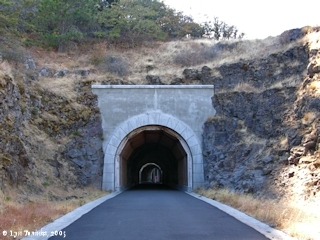 The "Twin Tunnels" of Mosier were a part of the Historic Columbia River Highway. Engineered by John A. Elliot and constructed between 1919 and 1921, the tunnels were closed in 1955 with the completion of Interstate 84 following the banks of the Columbia River. 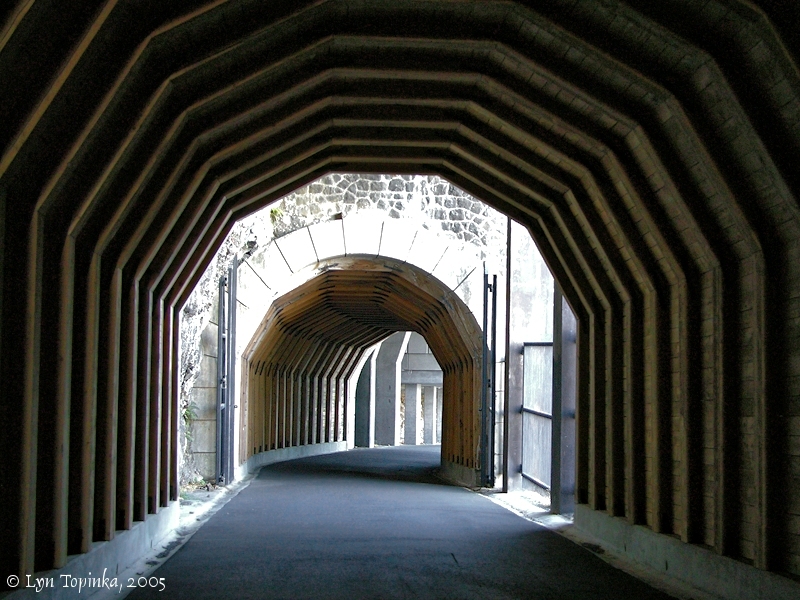 Originally the tunnels were 17 feet wide but with the advent of larger cars they were widened to 20 feet. 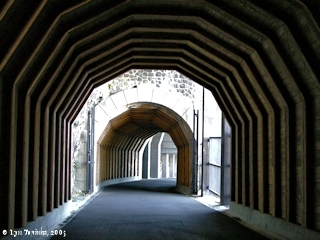 The Tunnels were closed in 1955 because of safety issues. 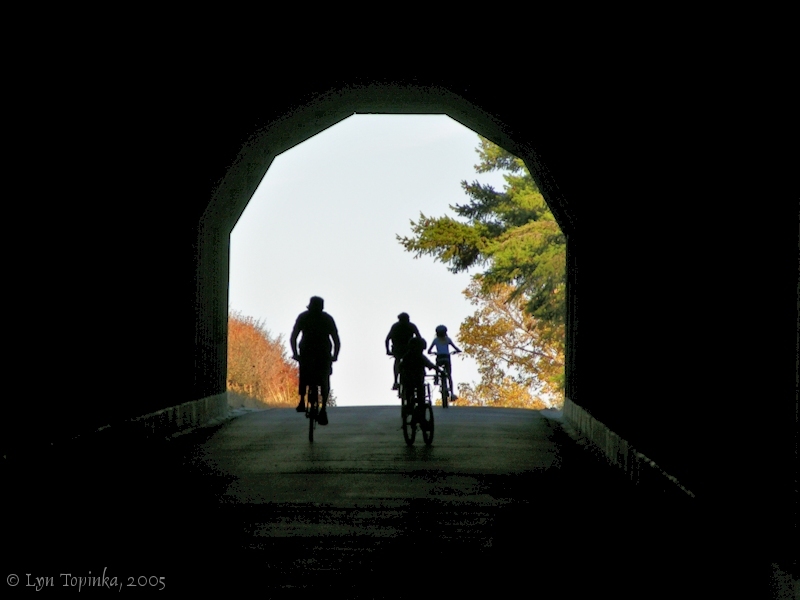 With help of Senator Mark Hatfield, the twin tunnels were re-opened in July 2000 for bicycle and foot traffic, and are now part of a 4.6-mile-long "Historic Columbia River Highway State Trail". The Mark O. Hatfield West Trailhead is near Hood River and the Mark O. Hatfield East Trailhead is outside of Mosier. The tunnels themselves are located on the trail closer to Mosier. The "Twin Tunnels" of Mosier were a part of the Historic Columbia River Highway. 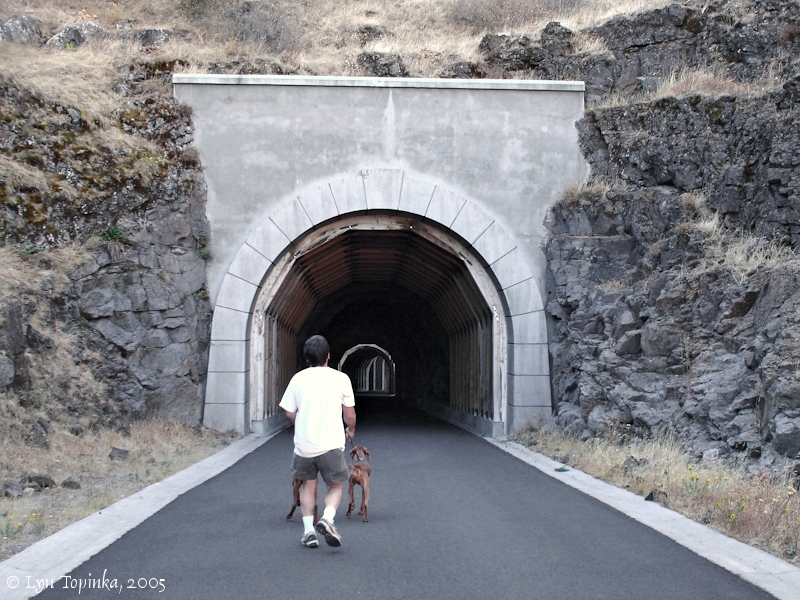 Built in the early 1920s, the tunnels were closed and sealed after the construction of Interstate 84. 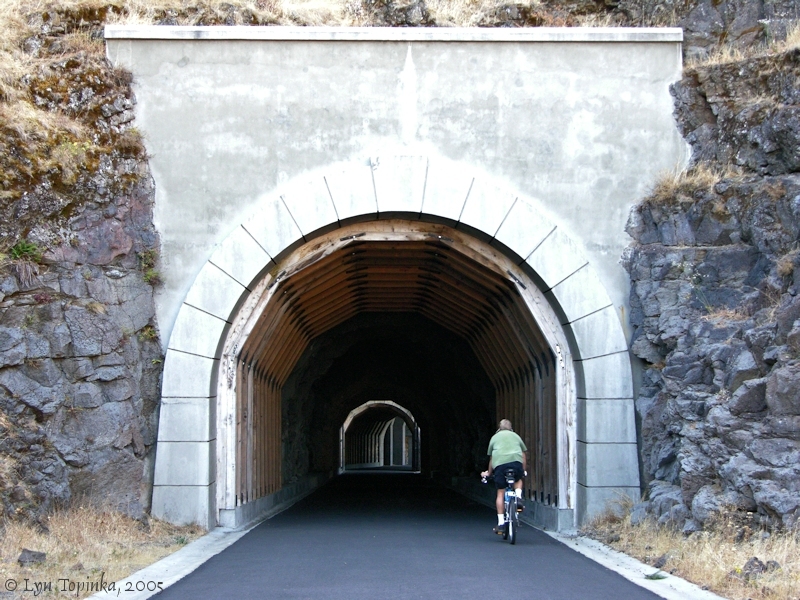 In 2000, with the help of Senator Mark Hatfield, the tunnels were once again opened as part of the 4.6 mile Historic Columbia River Highway State Trail, open to foot and bicycle traffic only. Mosier Twin Tunnels (1920, 1921, 1938, 1953, 1996): "These tunnels were bored out of a basalt outcropping. They consist of an 81-foot west bore, 24 feet of open space, and a 288-foot east bore. Total length was 493 feet with 369 feet of that in bores. 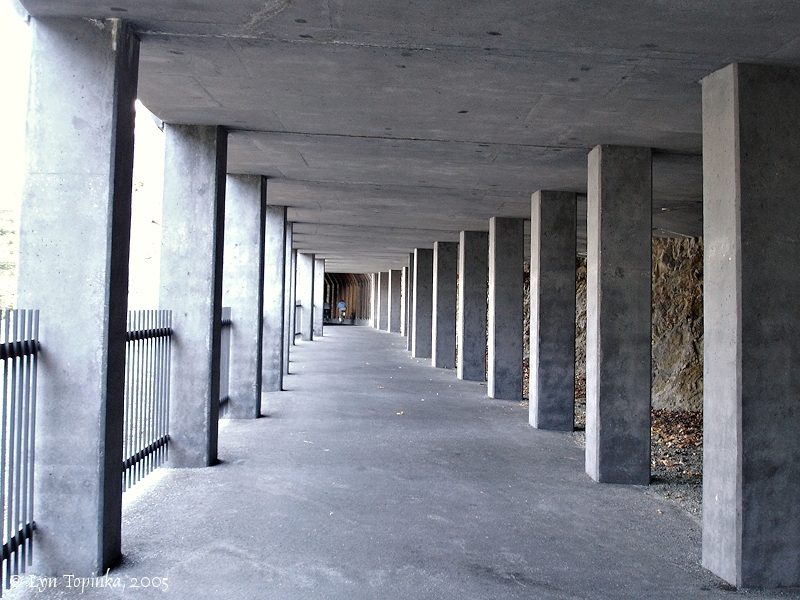 The orignal vertical clearance was 16 feet, with an 8'-8" radius measured from a springline of 7'-4" from the roadbed. Roadway width was 17'-4". Two windows measured 8 to 10 feet and were bored in the east tunnel. A cliff walk was constructed between the western most of the two windows to the open mid-tunnel area. The tunnels were completed in 1920. Because of severe rockfall, however, the tunnel portals were faced in basalt masonry veneer in 1921. 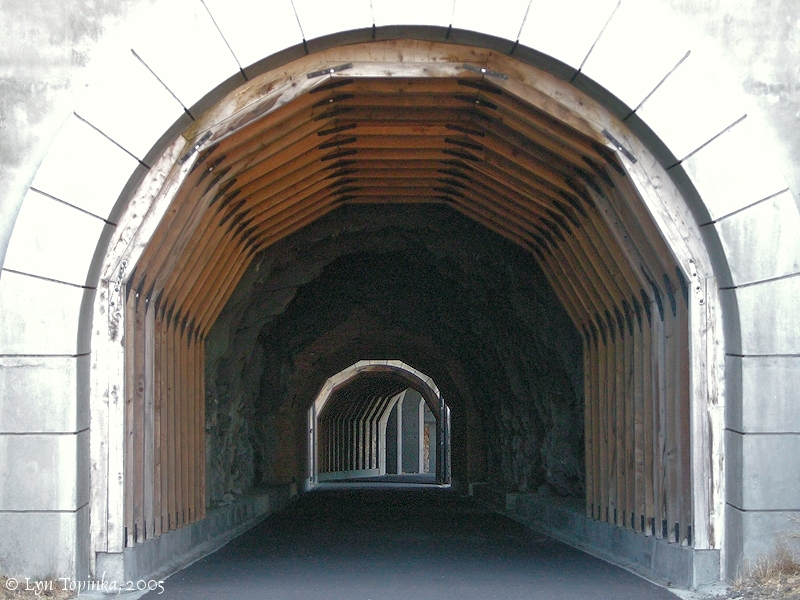 At the same time, the tunnels were partially lined with Port Orfocrd cedar lagging and timber sets. 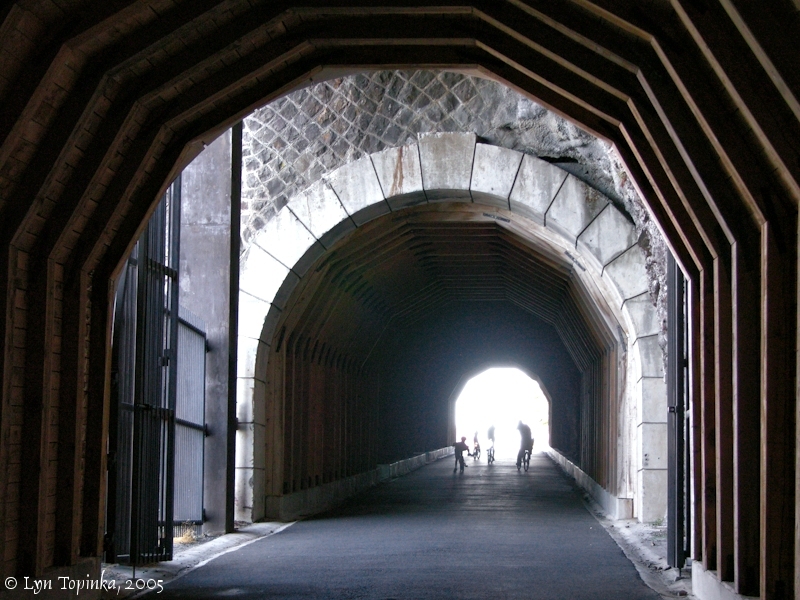 In 1938, the tunnel portals were widened to accomodate larger automobiles and transport trucks, and the tunnels were relined with cedar lagging and sets. Click image to enlarge Penny Postcard: Mosier Twin Tunnels, Mosier, Oregon, ca.1941. Penny Postcard, Postmarked 1941, "Twin Tunnels on Columbia River Highway Between Hood River & Mosier, Ore.". Published by The Portland Post Card Co., Portland, Oregon. Published by Pacific Novelty Co., San Francisco. In the private collection of Lyn Topinka. 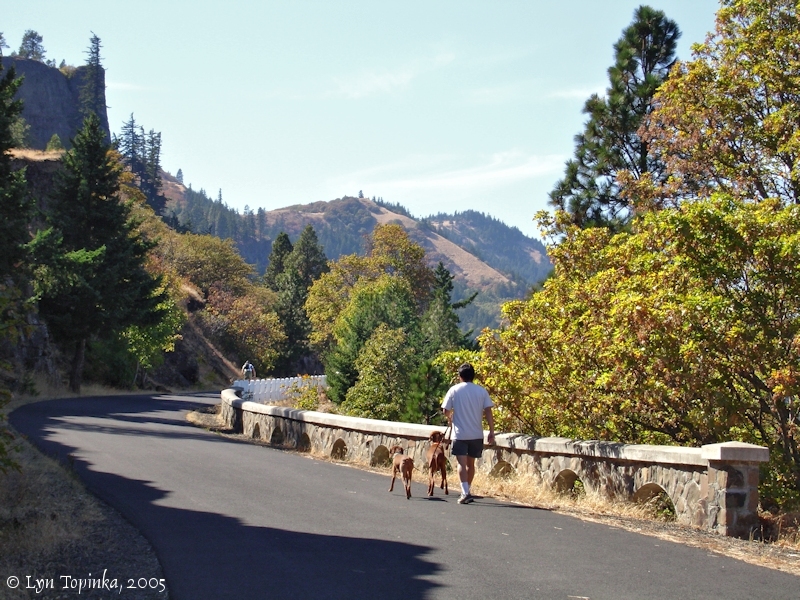 Click image to enlarge Walking towards the Mosier Twin Tunnels along the Historic Columbia River Highway State Trail. 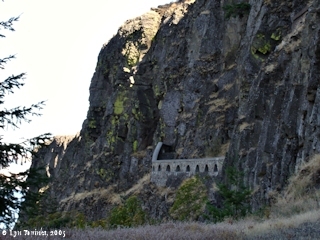 View along east part of the trail, between Mosier and the Twin Tunnels. Image taken September 18, 2005. Click image to enlarge Mosier Twin Tunnels. Image taken September 18, 2005. 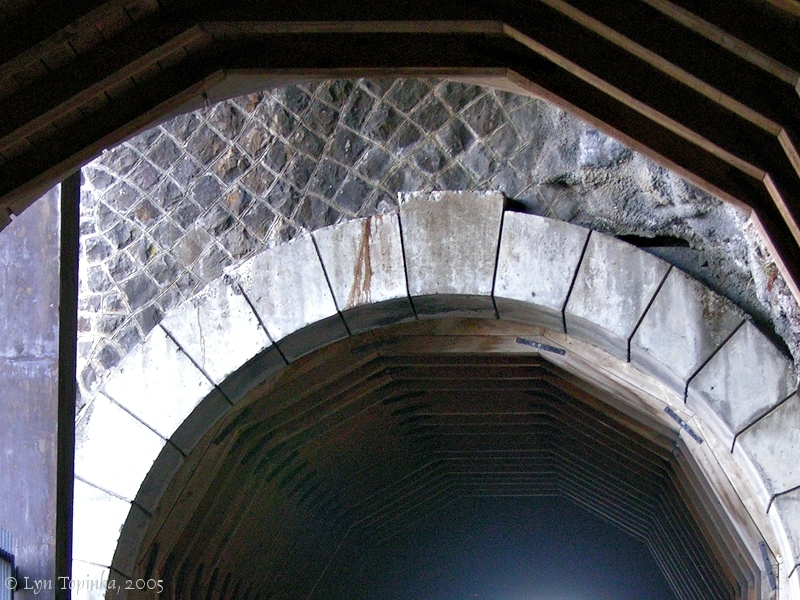 Click image to enlarge Stonework, Mosier Twin Tunnels. Image taken September 18, 2005. 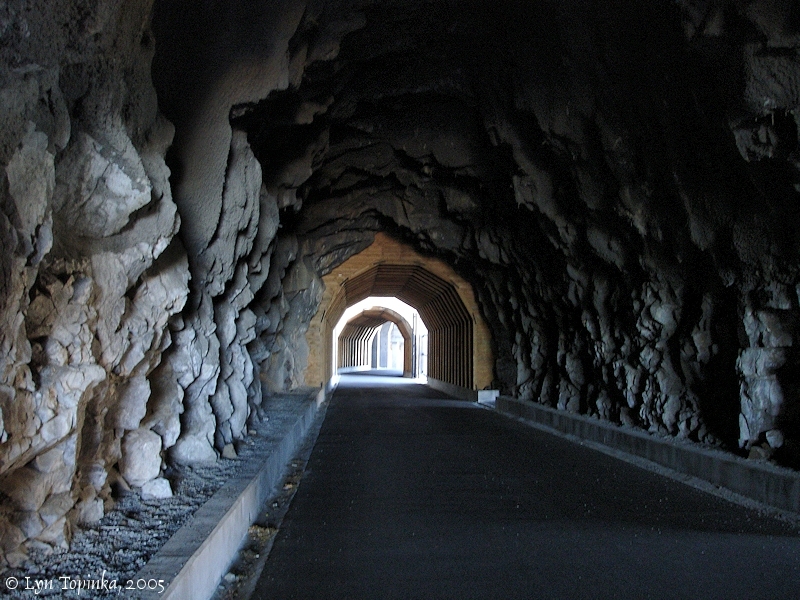 The restoration of the Mosier Twin Tunnels involved removal of the rock which had filled the tunnels, and the construction of a 700-foot-long "catchment structure" on the west end of the tunnels that utilizes cellular concrete, pea gravel and 25 foot anchor bars. Click image to enlarge Catchment Structure, Mosier Twin Tunnels. Image taken September 18, 2005. Click image to enlarge Looking towards Catchment Structure, Mosier Twin Tunnels. Image taken September 18, 2005. 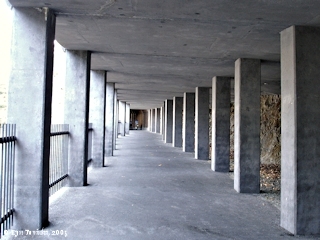 Click image to enlarge Outside Stairs and Walkway, Mosier Twin Tunnels. Image taken September 18, 2005. Gene, Riley, and Corey, members of my own "Corps of Discovery". 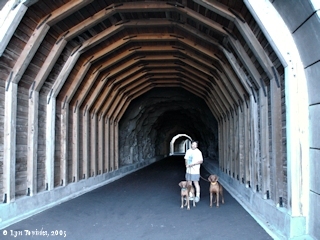 Click image to enlarge Corey, Riley, and Gene, entering East Portal, Mosier Twin Tunnels. Image taken September 18, 2005. 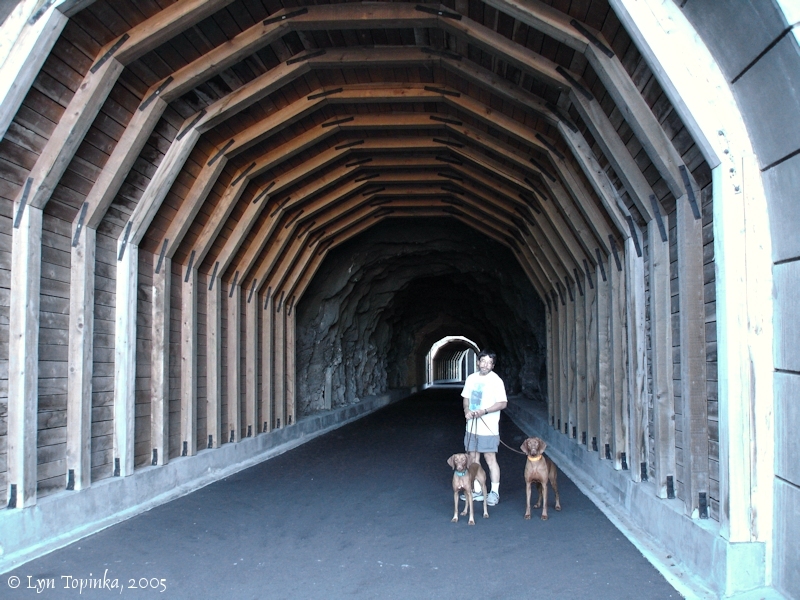 Click image to enlarge Inside, Mosier Twin Tunnels, with Corey, Riley, and Gene. Image taken September 18, 2005. 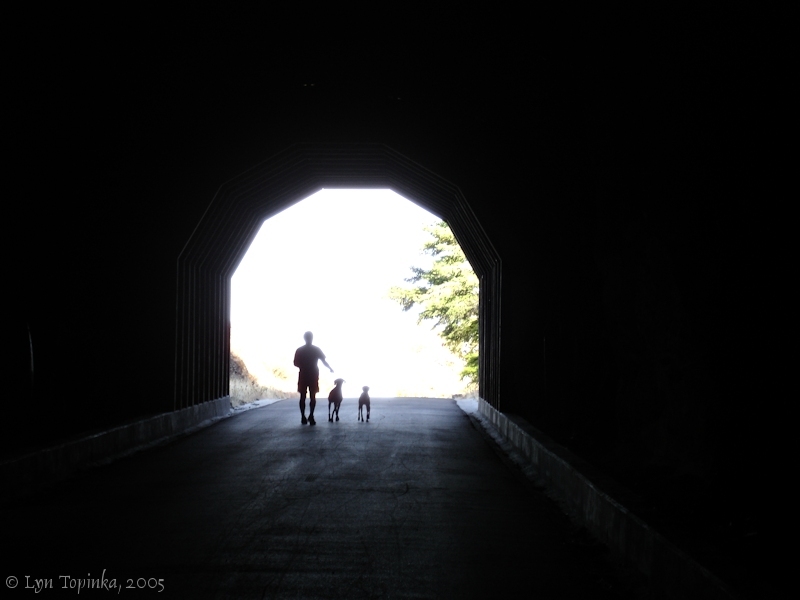 Click image to enlarge Between the Tunnels, Mosier Twin Tunnels, with Corey, Riley, and Gene. Image taken September 18, 2005. 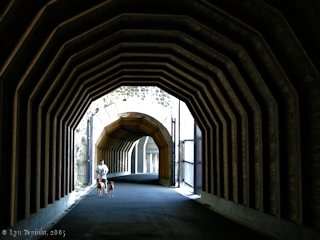 Click image to enlarge Exiting East Portal, Corey, Riley, and Gene, Mosier Tunnels. Image taken September 18, 2005.